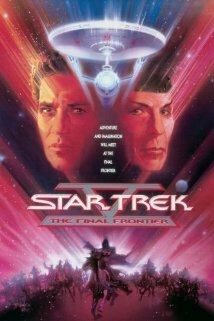 The fifth fi lm in the Star Trek film series is named Star Trek V: The Final Frontier. The movie aired in 1989 and offers even more information about everyone’s fan favorite Vulcan, Spock. This time, the Enterprise must deal with Spock’s half-brother who takes hostages to further his goals. Unlike most Vulcans, there seems to be something amiss about Spock’s brother. He is a rather emotional man. What is his brother searching for? Why would he need to take hostages? You will have to watch to find out. One thing is for certain, you will not be disappointed by the action, drama, and comedy in this film. To learn more, go to http://www.imdb.com/title/tt0098382/?ref_=fn_al_tt_1. This movie gets a five out of five popcorns rating.